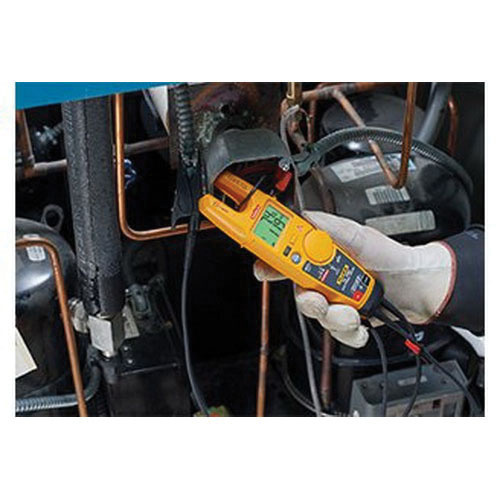 Fluke Electrical tester is ideal to measure up to 1000-Volt of voltage rating. It incorporates FieldSense technology for AC voltage, current and frequency measurement without making electrical contact to live voltage. This tester has a voltage rating of 1000-Volts AC/DC at 45 to 66-Hz frequency. It measures 61.1 mm x 259.3 mm x 43.8 mm. The electrical tester works on 2 x AA battery with 360-Hour continuous typical life or FieldSense battery with 200-Hour life. It has test leads with removable 4 mm probe caps. The tester meets CE, cCSAus, CAT III 1000-Volts, CAT IV 600-Volts, IEC/EN 61010-1, IEC/EN 61010-2-033 and IEC/EN 61326-1 standards.